Today I have a couple of interesting books to share with you. Both would make lovely gifts. Almost every kid falls in love with horses and wants one in their early life. Some outgrow the desire, others don’t. 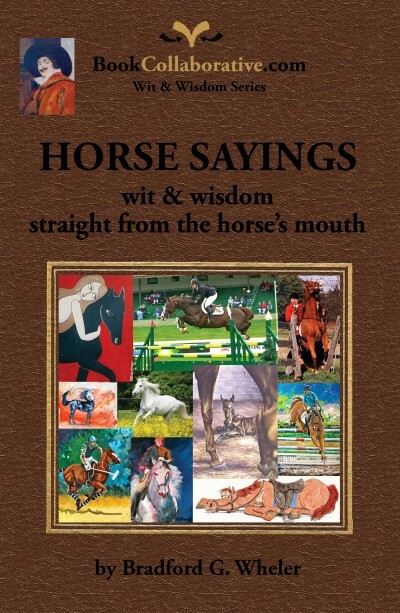 This is a collection of beautiful and thought-provoking horse-related quotations from various people throughout the world and from different eras. Each quote is accompanied by a gorgeous drawing, illustration or photograph depicting horses and their environment. Author Bradford G. Wheler has compiled the works of 61 artists and photographers from all over the world for this collection. According to the publisher, this book has two goals in mind: “first, to honor and highlight the horse through text and artwork, and secondly, to showcase talents of new and emerging artists who focus on creating horse art.” I think they have accomplished both goals beautifully. HORSE SAYINGS is a great book for any horse enthusiast. Trying to explain to young children how we have progressed from horse-drawn wagons to where we are today can sometimes we difficult. Author Connie Nordhielm Wooldridge has created a wonderful teaching tool in the form of her new book, JUST FINE THE WAY THEY ARE: FROM DIRT ROADS TO RAIL ROADS TO INTERSTATES. This delightful book is aimed at upper elementary school readers. The story begins with tavern keeper John Slack who is upset with two senators that want to build a National Road that will come right by his business. He doesn’t want the improved road because wagon drivers will no longer get stuck in the mud and have to stay overnight at his establishment. From there the story follows 200 years of improvements to our transportation system that some people wanted, while the others didn’t. Each stage of the development has those who are happy with things just the way they are. The story line is beautifully illustrated by Richard Walz. The rich illustrations bring the characters to life and give depth to the story. 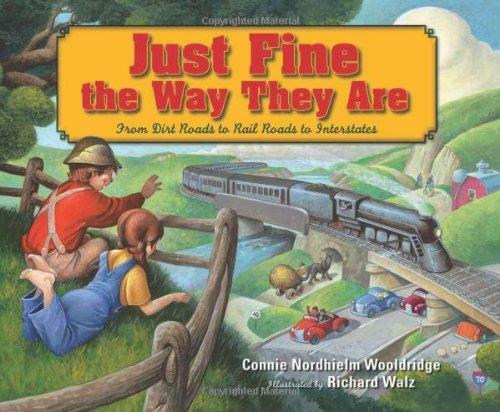 JUST FINE THE WAY THEY ARE can be a fun reading book for youngsters or used as a teaching guide. The book includes a timeline, a bibliography, websites and places of interest to visit. Mason - What terrific book ideas you've shared! One thing I love about your blog is the rich variety of book ideas you have, from mysteries to romance, to children's books and more. I've always loved horses, so I'll have to check that quotation book out :-). I just tweeted this and shared it on Facebook. When I was about 8 I was OBSESSED with horses! Particularly Chestnut ones. I know it is common for little girls to adore horses,OMG I was crazy about them! I still love them, they have the most sensitive eyes. They are majestic, gentle and loving beings. I shared this with some friends that I know are horse fanatics as well! These look like great books for kids. Wonder if Mr. Ed approves? THose are some really interesting books that discuss history. I think they will appeal to the young audiences.